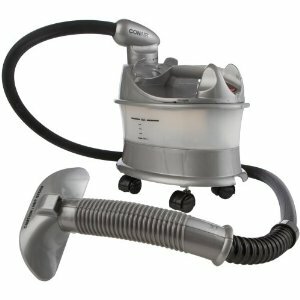 Fabric steam cleaner models reviewed on this page are from a wide range of manufacturers. 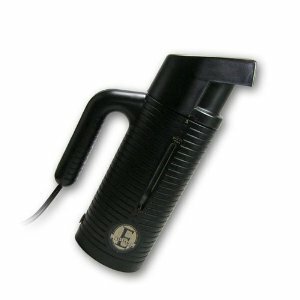 These range from portable fabric steamers such as the popular Jiffy travel steamer and the canister models that are used in residential homes as well as for commercial purposes. Considered from a fabric point of view, steaming your clothing and other fabric such as curtains, bedding and even upholstery causes less damage than ironing. 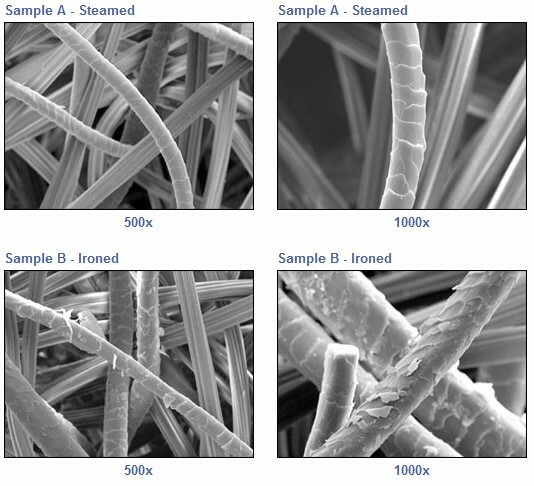 Lab verified studies have shown that pressing your fabrics with a hot iron sole is actually distractive to your fabric. This constitutes poor fabric care which will lead to a rapid deterioration of the quality and strength of your fabric. Fabric steam cleaners use very hot steam to kill wringles on your fabric straightening them out using heat. They also remove stains and odors from clothing creating a home dry cleaning. Studies also show this to be the best way to care for your fabric. In searching for the most suitable fabric steamer, your concern above all should be the temperature produced by the steamer. A weak steamer will not do much justice to your clothing. It may even leave them socked with water or moisture when you are wanting something different. If you are in search of an uphostery steamer, follow link to have a look at our page dedicated to upholstery steam cleaners reviews from a variety of manufacturers. The following are some fabric steamers which we have done our best to review and help you make a decison on your purchase. Please note that many of these are also suitable to steam clean your upholstery. 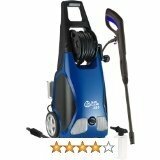 This is a highly rated steamer which has earned a great deal of positive ratings from impressed users. It has an average rating of four out of five stars online. You may see the end of this particular review for specific areas of complaints that you might also want to know about concerning this steamer. It is a fast heating steamer that gives you steam within 10 seconds. It also comes with a pressing pad to help you safely steam your garments. You also have a choice to use the accompanying telescopic hanger which you can use to hang your fabric as you are steaming. This is a very hot steamer. One can already tell this is so by the high wattage at 1500w. The higher the wattage the more likely it is for a steamer to be very effecient. High wattage steamers such as Ladybug steam cleaners and Vapamore steam cleaners are known as dry vapor steamers due to the very low mositure content found in the steam which is essentially vapor. When using the Steamfast fabric steam cleaner be careful that the hose/tubing and the steamer head can get dangerously hot. To solve this problem some users have opted to wearing protective clothing, something we also recommend. Quick Tip: When steaming some users find it much easier to steam from inside as it is much easier to handle. However there is also danger to get burnt by the hot steam. - putting some brakes to the steamer wheels would help a great deal to stop it loosely moving whilst steaming. 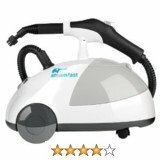 This Steamfast SF-407 1500watt fabric steam cleaner sells for about $65.00 online. You may also have a look at general reviews of other Steamfast steamers. Jeffy Steamer is one of America's leading fabric steamer manufacturing company. It has a tremendous positive reputation amongst users of travel steamers, personal home steamers and professional steamers who steam on a commercial basis. 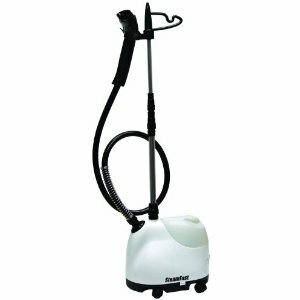 This Jiffy EASTEAM model is a travel fabric steam cleaner model which has very high ratings amongst the traveling executives and business people. The steamer is powered by 600 watts of power which is relatively high for a handheld fabric steamer. This also translates to hotter steam. It produces 15 minutes of continous steaming which is roughly up to six garments. It has particulary impressed so many travellers due to the fact that it costs just about the same amount it would cost you to have your whole wardrope done at a hotel on a single trip. This model costs just under $60.00 online. When in use ensure that the steamer remains upright to avoid spitting hot water. Moving this handheld steamer rapidly will also result in dangerous hot water being spit out through the steam pours. It appears maximum concetration of steam for your fabric is achieved when steam is standing upright. Also avoid use of hard water which has mineral deposits such as calcium. This will damage the fabric steam cleaner in the medium to long term. As a safety precaution, please note that the steamer will switch itself off when the water tank is empty. We recommend this fabric steam cleaner for your travel. This steamer enjoys very good ratings from users and owners alike. It however has less wattage compared to the Steamfast model reviewed first above. It has a wattage of 1200w. It is used for the dry cleaning of your clothing, bedding, curtains and other garments and fabrics. It heats steam up within 5 minutes and gurantees up to 40 minutes of non-stop steam cleaning. - the four wheels makes it easier to drag along from one room to the other doing your steaming. - steamer wastes electricity by having to boil the whole tank each time a single item is to be ironed.